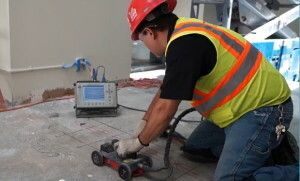 At CSI our focus is to increase the safety of onsite coring, cutting and drilling of concrete through non-destructive ground penetrating radar. We work closely with our clients to provide information on where to cut, drill or core so that all rebar, utilities etc are avoided and no costly errors are made that could result in site downtime, injury or even death. Our skilled technicians use a range of antennas that allow us to accurately locate rebar, post tensioning, conduits and voiding within and under slabs as well as detect utilities, subsidence, services, data, storm water and sewerage to a depth of 5m. We also carry out concrete testing. Why Should You Use GPR Instead Of X-ray? With the use of GPR our technicians can work safely around other trades without the need to either evacuate or create an exclusion zone on the work site which was the case with the old x-ray technology. GPR Is Also Referred To As X-ray Or Underground Scanning. X-ray operators need access to both sides of the structure as the transmitter, or source, and the receiver needs to be opposed to each other. GPR only needs access to one side of the structure being tested because RADAR has the transmitter and receiver in one unit and relies on the reflection of radio waves to produce a meaningful image. X-ray is damaging to the human body so exclusion zones around the area being tested are necessary, meaning part or all of the site will need to be evacuated. The energy emitted from our GPR units is many times lower than a mobile phone. This means that there is no need for a site to be evacuated nor there is any risk of harmful exposure. X-ray can only produce one image on each exposure meaning that large areas are very time consuming and costly to investigate as the transmitter and receiver need to be constantly moved. GPR can scan large areas in one or more scrolling images producing a vertical sectional view of the test area much like a MRI from a hospital. These images can be placed together to form a virtual 3D model. our technicians can locate them quickly and accurately.